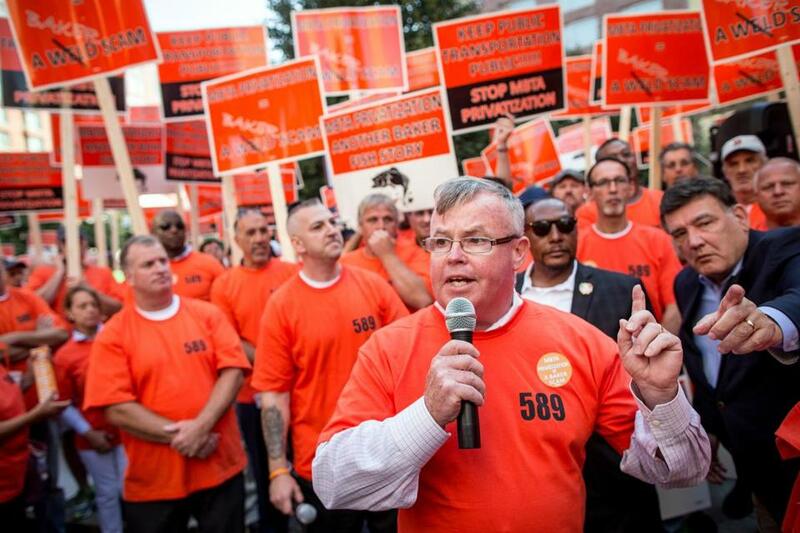 Massachusetts Union President James M. O’Brien spoke as employees of the MBTA protested outside the Park Plaza Hotel in Boston earlier this month. Governor Charlie Baker’s plan to turn over a few late-night MBTA bus routes to private vendors is part of a vast right-wing conspiracy to destroy unions — backed locally by a subversive think tank called the Pioneer Institute. Based on drama-queen rhetoric like that — during Boston’s annual Labor Day breakfast — you would think Massachusetts was headed back to the era of the famous Boston Police Strike of Sept. 9, 1919. That’s when striking officers seeking better wages and working conditions were described as deserters and Bolsheviks and, in the end, lost their jobs. For his role in standing up to them, then Governor Calvin Coolidge won national acclaim, and unions suffered a major setback. Compare that labor-hostile dynamic to today’s worker-friendly reality. This year’s breakfast headliner was President Obama, who used the visit to announce that he is requiring federal contractors to offer seven paid sick days a year to their employees, a tribute to earned sick time legislation passed recently in Massachusetts. A new law that raises the statewide minimum wage to $9 an hour in January and up to $11 an hour by 2017 also enhances the Bay State’s labor-friendly reputation. And there are other noteworthy gains, such as a bill of rights for domestic workers and new alliances with religious and community groups. Still, in states like Wisconsin and New Jersey, Republican governors have been attacking hard-fought union rights. 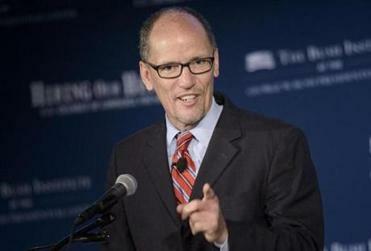 So labor now fears the Republican governor of Massachusetts will pursue the same agenda. Baker insists he wants to fix the T — not privatize it, slash services, or lay off employees. But union organizers do not believe him. So on this Labor Day, they did not let any feel-good news detract from their larger mission: demanding fealty from Democratic officeholders and attacking anyone who challenges labor’s right to call the shots. Employers need to recognize their responsibility — to their workers and the nation — to help make sure that prosperity is broadly shared. That includes the Pioneer Institute, which has been using data-driven research and multimedia savvy to make its case that reform before revenue is needed at the T. Its success at driving public debate shows where the front line of this battle has moved — from large numbers of demonstrators taking to the streets to statistics cited in reports and promoted via social media. Labor is adjusting. For the first time, the breakfast was live-tweeted by its organizers. But the MBTA Carmen’s Union also fought back the old-fashioned way. Hundreds of members clad in orange T-shirts rallied outside the Park Plaza Hotel, expressing loud contempt for Baker and his privatization proposal. Union leaders at the breakfast went on to paint the battle over bus routes as a stark reminder of the danger labor faces from a nationwide, extremist, antiunion campaign. “This show is now playing in this town, in this state,” warned Jim Snow, the AFL-CIO’s regional director. He specifically blasted the Pioneer Institute as a “right wing think tank” with a “subversive” agenda. Its research is not just wrong — it’s “fantastical,” charged Snow. If so, labor must prove it, case by case. The Pioneer Institute was founded in 1988 by Lovett C. “Pete” Peters, a wealthy businessman and political conservative. A young Baker was one of its founding codirectors. Today, David Koch is a major donor, leading union sympathizers to describe Pioneer’s mission as a “politically-driven, Koch-backed campaign to undermine Boston transit.” Still, Pioneer’s paid staff currently includes several Democrats: Barbara Anthony, a former secretary of consumer affairs; Thomas Birmingham, a labor lawyer and former president of the Massachusetts Senate; and Gregory Sullivan, a former state inspector general. Jim Stergios, the Pioneer Institute’s executive director, said he does not mind being called subversive if that means “we are subverting a state of affairs that needs reform.” Pioneer argues relentlessly for charter schools. It has also come out with a series of reports highlighting what it considers overspending and poor use of resources at the MBTA. There’s a lesson in that for labor: Hot rhetoric works when you are preaching to the choir. It takes more than angry words to shape public opinion. • Dante Ramos: Why wouldn’t unions support wage hikes?